This is the latest development coming out of Custom Steel for the SR20. 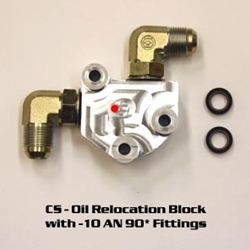 Its an oil relocation block. This bolts onto the back of the block replacing the oil filter spout. That being said, you also have to find yourself a remote oil filter bracket of sorts, and associated tubing to go with this. This is shown on a high port engine.